Air Movement - AirSys Tech Inc. provider of air filtration, air movement, ventilation equipment, finishing systems and design services. 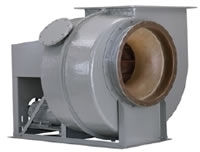 Industrial fans and blowers, regenerative blowers, duel stage blowers, ventilators, panel fans, FRP construction, pressure blowers the list goes on. Blowers come in all designs, arrangements and discharges. AirSys has worked to assemble the best of the best when it comes to air movement. 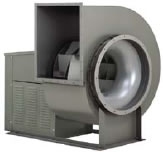 Fans can be constructed of a multitude of materials including carbon steel, stainless steel, FRP. Coated and painted any color or with any combination to achieve the desired result. Designed for ventilation, clean-side dust collection, process & more. Backward inclined and Acoustafoil (Acf) wheels provide excellent performance and efficiency. Airflows of up 350,000 cfm. Pressures of up to 128” of w.c.
General industrial wheels, radial tip wheels & dust handling wheels to prevent buildup on the fan blades. Typical applications include dust collection, pneumatic conveying and process air. Airflows of up 220,000 cfm. Pressures of up to 70” of w.c.
Industrial process fans high-capacity, high-pressure industrial processes such as combustion air, thermal oxidation, scrubbers, and supply air. Corrosion resistant fans that are an alternative to other materials such as stainless steel or special coatings. Excellent for wastewater treatment, chemical process and scrubber systems. Airflows of up 90,000 cfm. Pressures of up to 25” of w.c.
Building ventilation, cooling & fume extraction are just some of the applications for axial fans. Axial fans include Vane Axial, Tube Axial, Duct Fans and wall propeller fans. Airflows of up 140,000 cfm. Pressures of up to 14” of w.c.